Society6 Me & Paranormal You - James Roper Design - Palmistry (white lettering) Duvet Covers Twin: 68" x 88"
Society6 Me & Paranormal You - James Roper Design - Palmistry (white lettering) Duvet Cover by mapy. 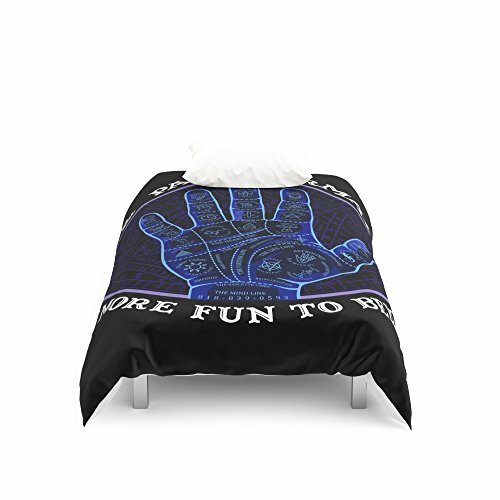 Cover yourself in creativity with our ultra soft microfiber duvet covers. Hand sewn and meticulously crafted, these lightweight duvet covers vividly feature your favorite designs with a soft white reverse side. A durable and hidden zipper offers simple assembly for easy care - machine washable with cold water on gentle cycle with mild detergent. Available for King, Queen and Full duvets - duvet insert not included. *Queen duvet works for Twin XL beds.